Before I start discussing close reading in the second grade classroom, I want to take a minute to acknowledge educators and students across the Northeast, who over the past two weeks have dealt with not just superstorm Sandy, but a Nor’easter! Some schools sustained significant flooding and damage, or have classrooms without heat or power. And in some areas, even though the children are back in the classrooms, after a long day teachers and students head home to clean and repair damage sustained to their own homes and communities. And last week, they did that in the wind and snow. If that’s not dedication, I don’t know what is. My thoughts are with everyone who continues to be affected by this awful streak of weather. Now, back to our regularly scheduled programming. Over the next several weeks, I’ll be modeling how to do a close reading at several different grade levels. Last week, I wrote about close reading in first grade. Next up: Close Reading in Second Grade using the L level text Under the Lemon Moon by Edith Hope Fine and illustrated by Rene King Moreno. Question 1 (Knowledge): Can you list several examples of onomatopoeia in the story so far? Why do authors use onomatopoeia? Question 2 (Comprehension & Analysis): How would you rephrase the meaning of “mi arbolito”? What clues does the author give you as to the meaning of that phrase? What language is that phrase? How do you know? What clues does the author give you? Why do you think the author chose to include Spanish words and phrases in this story? Question 3 (Comprehension): What details does Edith Hope Fine include on the first page to set the scene for the story? Why does she choose to include these details? Question 4 (Application): Edith Hope Fine has chosen strong, specific verbs so far. For example, on page 5, she uses the strong, specific verb “crooned” instead of the everyday verb “sang.” What are some other examples of strong, specific verbs that Edith Hope Fine used to describe characters’ actions? Question 5 (Analysis): In the beginning of the story, instead of telling us Rosalinda scared the Night Man away, Edith Hope Fine described what Rosalinda and Blanca did that caused the Night Man to cry out and run away. Can you identify other parts in the story where the author used that same “show not tell” strategy? Question 6 (Synthesis): What words or images did the author use to build suspense? What other words or details would you add to the story to further build suspense? Question 7 (Evaluation): Edith Hope Fine chooses to name the stranger in the garden “Night Man.” Why do you think she made the choice to give him a name? Do you agree with her choice of name? What would you have called the stranger in the garden if you were writing the story? Make a list of words that were unfamiliar to you before you read this story. How did you figure out what these words meant? Choose the most important sentence from the story so far. Why did you choose this sentence? Why do you feel it is so important? Choose a word that you learned or particularly liked from the beginning of the story. Write the meaning of the word in your own words, then draw a picture that shows what the word means. Choose a word that best represents the story so far. Is there a time in your life when this word applied to or was important to you? Is there a time when this word was important in another text you read? List some descriptive words Edith Hope Fine uses to set the scene or to show characters thoughts, actions and feelings. What techniques did the author use to hook you into the story? To make the story suspenseful? To make the writing lively? So far, what word best describes Rosalinda? Cite evidence from the text to support your answer. What words or phrases from the story helped you visualize the story? What are your favorite questions to ask when doing a close reading focused on author’s craft, language and word choice? Previous PostWhy is Veterans Day important?Next PostWhat is Diwali? As a great-grandmother, which means I can remember my own reading instruction, as well as that of my children, grandchildren, and now that of my great-grandchildren, I was perplexed when I heard that “close reading” is now to be taught to school children from the very start of their reading life. Wanting to educate myself, I have read all four of Jaclyn Deforge’s well-conceived and well-phrased posts on the subject. And now all I can conclude is that trying to meet this “standard” is going to be disastrous for both children and teachers. We are talking about very young children–say ages five to eight–who have just heard or read a short, illustrated text. Some of them liked it, some of them loved it, and some of them waited patiently for a change in activity so that they could move around the classroom instead of being required to sit and absorb the story. Very well, it has ever been thus in public schools. But now…now they are expected to stay focused on the story, to decide why the author wrote it the way he did, why he used certain words, why he chose to set the story in, say, another country instead of this one. It’s not a story any more, it’s a lesson. If the child was in the group that loved the story, whom the story transported to another world, he will now have to acknowledge that it wasn’t a real world at all, but another adult construct he has to study. If he merely liked it, he will like it less and less the longer he is asked to focus on it, and if he was waiting for a change in activity..well, you know how he feels. (And I haven’t even mentioned how frustrated the teacher becomes as she tries to interest her charges in questions they are not willing or able to keep thinking about.) This is how a teacher is supposed to foster a love of reading in young children? My conclusion, which I devoutly hope someone will prove mistaken, is that this common core standard is counterproductive in every respect. I pity the teachers. I pity the children. While this is true. The stories I love and remember the most from school were the ones my teacher went in depth with and we studied! Jaclyn, thanks so much for turning the spotlight on my Under the Lemon Moon in this post. I love the comments I get about this book and am glad it’s available from Lee & Low in both English and Spanish. All teachers and visiting authors (I’ve been both) adjust books to their audience or grade level. 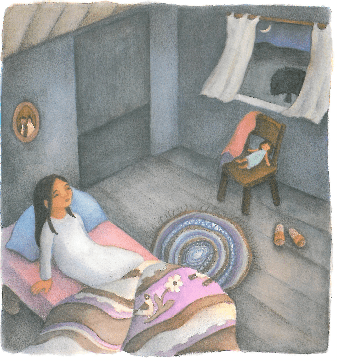 When I’m with younger children at schools, I read some parts of Lemon Moon and tell other parts, with lots of interaction throughout for the students. 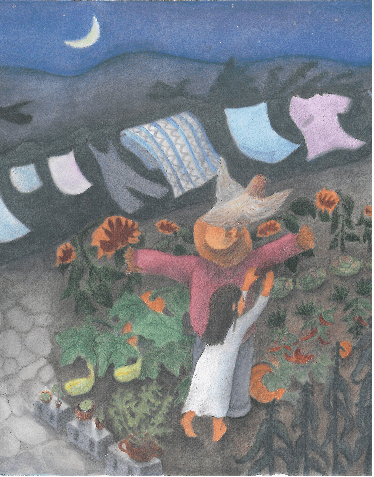 We say the first line together (“Deep in the night Rosalinda heard noises”), moving our hands to the rhythm of the words. We brawk and flap like chickens. “Three times only,” I say, brawking, and 98% of the time we get just three brawks when we do in en masse). On my signal, they say “Gracias” where it comes in the text. My approach also depends on whether the group has heard or read the book already . . . We talk about how Rene King Moreno made the dragonflies and butterflies huge to match the magical tone of the tale, then we make butterflies with our hands. I say the last line (“Rosalinda’s cart was empty, but her heart was as big as a lemon moon”), then we repeat it together with gestures, making a rectangle in the air for “cart,” shrugging with hands up for “empty,” touching our hearts for “heart,” and forming a big old lemon moon with arms high, hands clasped above our heads. This active word play keeps even the wiggliest of listeners engaged. At this point they’ve sat on their bottoms long enough, so they become growing lemon trees, standing slowly without a word (after all, trees don’t talk) and waving their arms slowly like branches, then sitting down for a few more minutes to talk about the book and ask questions. Skilled teachers know how to get to the heart of the story and those all-important higher levels of thinking while keeping the experience light, intriguing, joyful. Discussion of the book, exploration of the ideas may take place over over several readings. Pulling students into books—letting young readers dive deep and wide—is one of the warmest, most important, and most rewarding parts of teaching. The same goes for writing for children, of course. Thank you both for your thought-provoking comments!!! I have some thoughts to share, but they’re a bit lengthy to post in the comments section, so be sure to check back for my post on Monday 🙂 I’ll post the link here when its live.